Writer Jack Thorne (This is England, Let The Right One In, Harry Potter and the Cursed Child) breathes new life into Georg Büchner's Woyzeck, one of the most extraordinary plays ever written. It’s 1980s Berlin. The Cold War rages and the world sits at a crossroads between Capitalism and Communism. On the border between East and West, a young soldier (John Boyega) and the love of his life are desperately trying to build a better future for their child. Read more on The Old Vic website. We are giving one of you the chance to win a pair of tickets to see this unmissable production with British rising star John Boyega (Attack the Block, Star Wars: The Force Awakens) in the title role. The winner can redeem tickets for performances from 24 May – 2 Jun. One lucky winner will be selected at random from the entries submitted. This competition closes on Sunday 14 May at midnight. We will notify winners the following day. To enter this giveaway, simply fill in the form below with your Curzon membership details. Good luck! 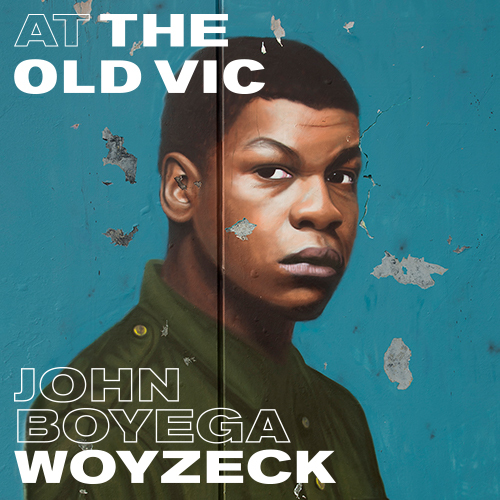 Prize is two tickets to Woyzeck at The Old Vic Theatre. Tickets available for Mon – Thu performances from 24 May – 2 Jun. Tickets are subject to availability, non-transferable, and no cash alternative with be offered. Tickets are subject to availability. Tickets must be collected from the box office and will not be sent. No transport costs are covered. The competition closes on Sunday 14 May at 23:59. If the winner does not claim their prize within 7 days of being notified, then their prize will be forfeited and another winner will be selected.